Toronto would win the Stanley Cup that year — a strange sentence to write and believe in, today. This was 1947, April. The Canadiens were the defending champions, and they started the Finals strongly enough, prevailing at home by a score of 6-0. The Leafs rallied themselves to win four of the next five games, including the one depicted here, a 2-1 victory secured at Maple Leaf Gardens by a Syl Apps goal in overtime. 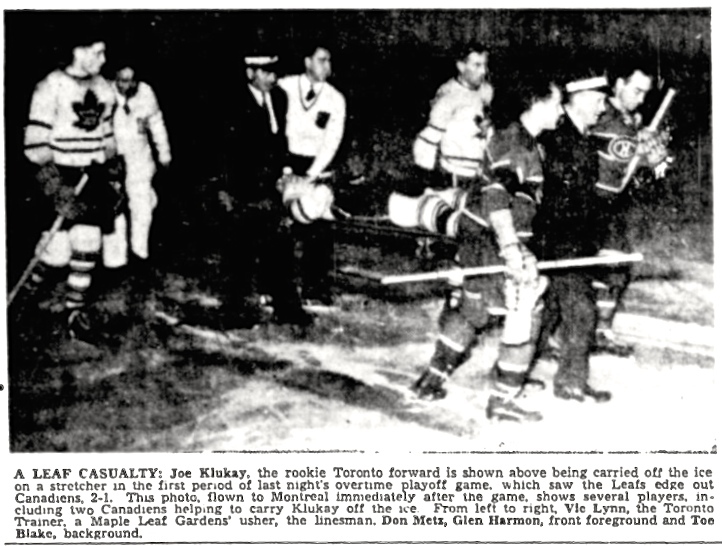 “The game started off on a hectic note,” Jim Vipond accounted next day in The Globe and Mail, “and Referee Bill Chadwick, who handled a competent game, had his work cut out to prevent a riot.” In the moments before the camera found its focus, Kenny Reardon, ebullient Montreal defenceman, boarded Toronto’s rookie left winger Joe Klukay, “qui s’est frappé (La Patrie reported) violemment sur la clôture.” That’s him on the stretcher — you can just spy his nose through the arms of an attendant teammate. He was knocked out, Montreal and Toronto reporters mostly agreed, and his scalp wanted stitching. “The fans screamed for a major penalty,” Vipond wrote, “and an electric tenseness seemed to fill the big Carlton Street sports palace. 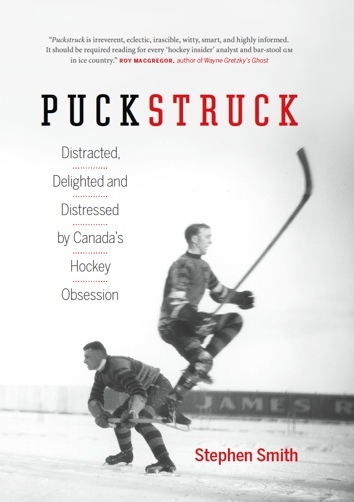 The game was less than five minutes old.” Reardon went to serve a minor; Klukay was carried from the ice. 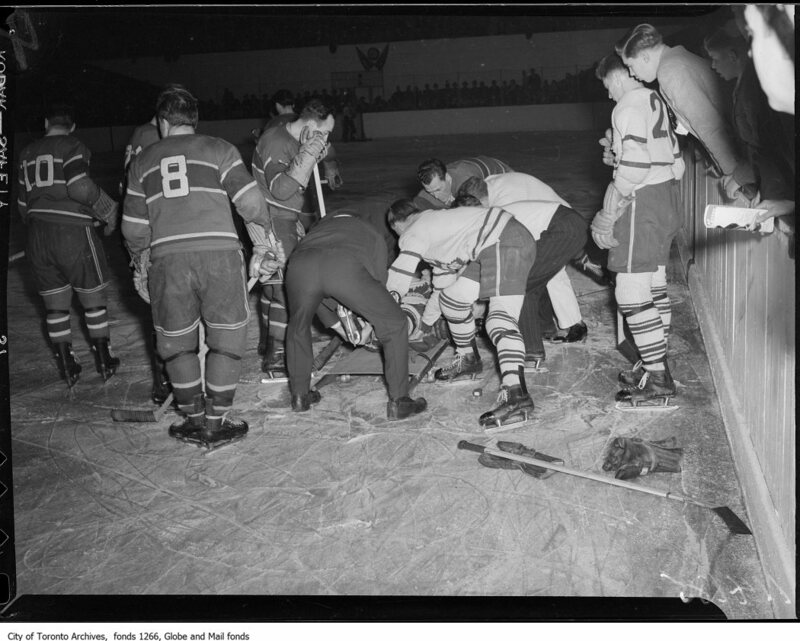 Also putting in an appearance above are Montreal’s Butch Bouchard (leaning over the patient) along with Toe Blake (observing, glove on stick), Glen Harmon (8), and Buddy O’Connor (10). Apps’ winning goal came after 16 minutes and 36 seconds of overtime. Jim Vipond circulated through the Leafs’ dressing room afterwards, where he saw an exhausted Toronto coach, Hap Day, and a happy, Coke-drinking Conn Smythe. “It isn’t funny,” Day told Vipond, with no further explanation. “I’m proud of the whole team,” Smythe said. The Montreal room was more subdued. With the extra period, they should have missed their train home, but the 11.10 to Montreal was holding for them. The Canadiens dressed quickly and headed for Union Station.